Don’t go anywhere: if you haven’t already tried this amazingly unique slot then you need to give Hold It Casino a go! Players who enjoy our other slots, such as: Happy Fruits, Hot Chance and Fruit Fest are going to love this game. It’s a fantastic game for beginners who are new to the world of online slots and casinos but also perfect for well-seasoned slots players who are looking for something retro, fun and totally unique. Get a Hold of This! Hold It Casino, brought to you by NovomaticCasino.co.uk, is packed full of those symbols you’ve come to know and love. Favourites, like the juicy cherries, oranges and lemons are all there, as well as the lucky four-leaf clover and the golden bell. The cherries, oranges, lemons, plums and pears are the lowest-paying symbols which pay up to x2 your bet. Then you have the strawberries and the four-leaf clover, which pay up to x4 your bet. The watermelon and the grapes pay up to x6 your bet; the golden bell pays up to x10 and the ‘Hold It’ symbol pays up to x40! To get a payout, all you have to do is spin three or more matching symbols on consecutive reels from left to right. The ‘Hold It’ symbol is the highest-paying symbol and it is also the Wild symbol, which means it can substitute for any of the other symbols, giving you a better chance of getting those desired payouts! What’s unique about this ‘Hold It’ symbol is that it doesn’t only help you if it falls in a winning combination! The Wild ‘Hold It’ symbol, if it falls on the reels but doesn’t end up being a part of a winning combination, it will stick and hold the reel in place for the next spin! It only holds for one spin, so fingers crossed the reels will fall in your favour and the ‘Hold It’ symbol can do you some good substituting or perhaps two more will fall in place so you can get a big payout! Can You Hold It Together? 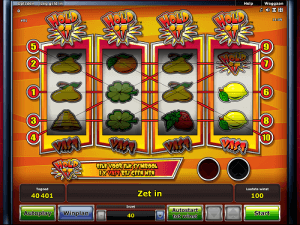 Like many other NovomaticCasino.co.uk games, you can play Hold It for fun until you feel as though you’re ready to play with and win real money. When you’re playing and you feel as though you’ve got a hang of the game, you can click ‘autoplay’ and watch as the reels spin on their own, without you having to lift a finger. When you’re out of autoplay mode, you can change your bet easily by using the plus and minus symbols, to either side of it, and you can look at the paytable to see how much each winning combination of symbols will pay out, depending on your current bet. Your bet will be clearly shown for you (and in this case the minimum bet is 0.10), as will your balance and the amount of your last win. Each time you get a win in Hold It Casino, you have the option to gamble it with the classic double-or-nothing gamble feature. Can you hold it together under pressure? Why not test yourself out! All you need to do is have the courage to click ‘gamble’ instead of ‘collect’ and make a guess as to whether you think the next card will be red or black. The colour of the last card is displayed for you underneath and if you guess correctly, you’ll double your bet! Are You Holding the Right Cards? Aside from our fantastic selection of slots and video slots, NovomaticCasino.co.uk also has a fantastic selection of card games, table games and live dealer games. If you think you’re one of those people who always seems to get dealt a good hand, then why not try your luck at a game or two of Live Poker or Live Blackjack. Are you holding all the right cards? Why don’t you find out! Playing our live dealer games will make you feel as though you’ve been transported to a real casino!